Dual-band 802.11ac wireless from your ISP? A featureful router that's free for EE users, but if you're not a customer, we recommend you look at other specialist options. We often recommend that you replace the free modem router you got from your ISP (Internet Service Provider) with a specialist modem router in order to get the most from your network. However, EE's Bright Box 2 Wireless Router might change all that. Routers and modems such as the Netgear R6300 and the Buffalo AirStation 1750 offer far more features and much better performance compared to the routers provided by ISPs. The performance difference isn't too much of a surprise when you consider that ISPs are giving theirs away for free. In truth, many home users don't care about extra features as long as they can easily connect their devices wirelessly to the internet. However, the Bright Box 2 Wireless Router is the first router to be offered by a UK ISP to support the new 802.11ac wireless protocol and will hopefully change that. 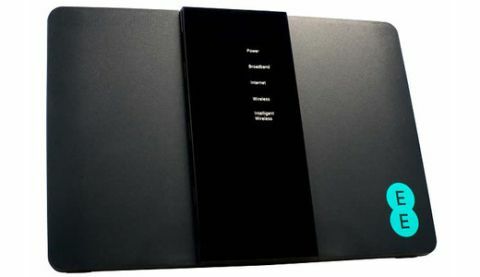 Along with the new 802.11ac protocol, which offers faster transfer speeds and an improved range with compatible devices - or one with an adapter such as the Netgear A6200 - the Bright Box 2 Wireless Router also offers simultaneous dual band, allowing for two separate wireless networks to avoid interference and get the best possible speeds. Out of the box, the Bright Box 2 Wireless Router looks great. The free routers we've seen in the past often look horrible, but the Bright Box 2 Wireless Router is sleek and attractive enough that you won't feel like it's intruding on your living space. On the side is a USB 2.0 port, which is handy for sharing USB drives and printers across your home network. It's here where the Bright Box 2 Wireless Router's budget background begins to show when compared to more expensive routers. They usually come with either two USB 2.0 ports or, as is increasingly common, a USB 3.0 port. The latter makes a lot of sense considering the improved bandwidth of 802.11ac allows for faster file transfers, so it's a shame to see it neglected here. Further compromises are evident when you turn the box over. It's nice to see a DSL port, as the Bright Box 2 Wireless Router has a built-in VDSL2 modem, meaning if you take the fibre-optic package from EE (or another ISP if you're buying the Bright Box 2 Wireless Router separately, or using it after you've switched from EE), then you won't need another box to connect it to. While there are four Ethernet ports on the back of the Bright Box 2 Wireless Router for connecting up devices that aren't wireless, only one of them is a gigabit Ethernet port. The other three are much slower 10/100 Ethernet ports. This is a real shame, as pretty much all modern routers will have at least four Gigabit Ethernet ports. Installation is pretty straightforward – especially if you're using EE, as the router will come preconfigured. All you'll need to do is plug it in and use the supplied username and password to connect to the network. If you're not using EE or you want to change the default settings, this can be achieved through the web-based interface. It's easy to access the router settings through a web browser, which means there's no CD included in the package. It actually makes things easier since you can access the settings no matter what device you're using or what operating system it's running, just as long as it's connected to the network. This being a router tied in with a particular ISP's broadband offering, we were expecting a limited amount of choice in the settings. However, we were pleasantly surprised. There is a wide range of options to configure, meaning there's plenty of scope for using the router in conjunction with another ISP (or simply using it as a router connected to another modem). The options are clearly laid out, and you can choose between 'Basic' and 'Advanced' modes, with the second option requiring some degree of prior knowledge about internet and networking settings. Like many modern routers that like to look good rather than be purely functional, the Bright Box 2 Wireless Router has antennas (a 2x2 array) built into the body of the router, unlike devices such as the TP-Link Archer C7 AC1750 that have external antennae. The benefits of external antennae include being able to position them to point in the direction of wireless weakspots in your home, and can often help expand the range of your wireless network. Other features included with the Bright Box 2 Wireless Router are Dynamic DNS, Virtual server and Virtual DMZ modes, firewall function and UPnP (short for Universal Plug and Play), a network protocol that makes it easy for various devices in a network to communicate with each other. So the feature set of the Bright Box 2 Wireless Router is a bit of a mixed bag, but how does it perform? Our tests between the Bright Box 2 Wireless Router and our laptop in the same room produced very good results of 354.37Mbps (44.30MBps), just a bit slower than the D-Link DIR-868L, and much faster than the AVM FRITZ!Box 3390. We then moved our test machine to another room. This impacted the Bright Box 2 Wireless Router's network speeds quite a bit, with the speed dropping to 13.4MBps (107.2Mbps). Presumably to keep the price of the router down, EE opted for a 2x2 antenna array, against the more common 3x3 arrays we've seen in top-of-the-range routers. This could be why the Bright Box 2 Wireless Router's generally excellent short range performance suffers so much at longer ranges. As we mentioned earlier, the Bright Box 2 Wireless Router is a bit of a mixed bag. It comes with some excellent features that haven't been seen in a free router, such as 802.11ac wireless, dual bands and built-in VDSL modem. However, it also has a number of cost-cutting measures that impact its performance, especially when compared to premium routers. The fact that this is free for EE customers, and is the first ISP-provided router with 802.11ac, is a big plus in itself. The built in VDSL modem and dual-band compatibility is also welcome. It's also easy to set up, especially if you've got an EE contract, where the router comes already configured. While its short range speeds were great, the quality of the wireless connection quickly dropped off once we put a wall between our laptop and the Bright Box 2 Wireless Router. The fact it only comes with one Gigabit Ethernet port and USB 2.0 limits its functionality as well. If you're an EE customer and are getting this router free, then you'll enjoy some of the latest networking features, as well as close range wireless speeds that will make people with other ISPs such as BT and TalkTalk green with envy. If you're not an EE customer, but are looking to buy this router separately, we'd recommend going for a specialist router such as the Netgear R6300.